The Bunkerkit panel consists of one or more layers of steel which encapsulate a variable blend of materials depending on the performance features required. This structure gives the panel two fundamental advantages: resistance and lightness. 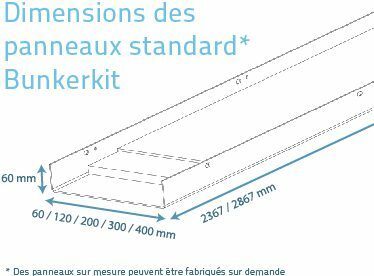 Bunkerkit is intended for the construction of modular partitions or enclosures for the protection of people and property. Bunkerkit is assembled using bolts only and can be quickly and easily installed while keeping the constraints on site to a minimum. The innovation of Bunkerkit lies mainly in its modularity. Mechanical assembly using bolts: no heavy work, no dust, no welding. Bunkerkit can be installed in just a few hours and limits the constraints on site thanks to its light elements and small dimensions. With Bunkerkit, a secure enclosure can be installed quickly and easily, indoors or outdoors, with or without a floor/ceiling and in the size required for its intended use. 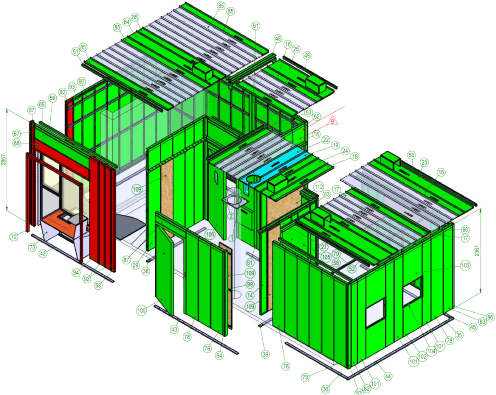 This modularity is evolutive: Bunkerkit can be adapted to future developments. If necessary, it can be dismantled and moved, thanks to its reusable panels. few installation constraints: no fire permit, no heavy work, no dust. Multiple and evolutive configurations: curved façades, corners, integration of windows, accessories, compatibility of elements with different performance levels, etc. Bunkerkit is tested as a whole by official and independent laboratories in terms of its burglary resistance and ballistic protection performance levels and its compliance with the safes standard. The ease of installation of Bunkerkit products is also guaranteed by the involvement of our engineering and design department throughout your project. 4numbering and traceability of each element. ongoing training cycles and support for our partners: assistance with fitting, approval and supervision of partners. It is installed within a very short period of time by our network of approved partners. The length of time this takes depends on the size and complexity of the Bunkerkit and its future environment (ease of access, anchorage in the existing building, etc.). The document entitled ‘Bunkerkit assembly instructions’ is provided to assist with the assembly process and each Bunkerkit is supplied with an individual study file. The pallets are arranged so as to present the first Bunkerkit elements to be assembled at the top, thereby avoiding unnecessary handling of elements before starting the assembly itself, wasted time on the site and the risk that the various elements will be scattered about.